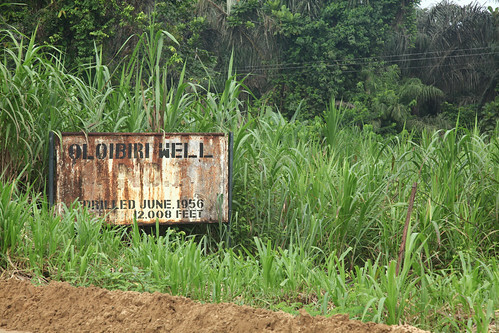 Oloibiri, originally uploaded by Jeremy Weate. a museum of sorts, a place where generations to come find out about the circumstances and beginnings of the oil discovery, exhibiting the first equipment used, photos of the workers involved, documentation, letters etc...a real tourist attraction. What a shame!! It looks so forlorn and derelict!! !Just like the history of oil in Nigeria. @ Jeremy...nice comment from Folake...just what I had on my mind when I saw that picture...Oloibiri is just another abandoned tourism goldmine in Naija. The Oloibiri Oil Museum is not a new idea and in fact is in the 2011 budget, with the PDTF having award the preliminary contracts LAST YEAR! The first well itself remains intact, and a full-scale museum of oil history on this location would be a joint project by the Bayelsa State government, the federal government and the Shell Petroleum Development Company of Nigeria. All valid points, but what good has the oil really done for the country?? I can't think of anything, help me out.